Close Quarter Engagement Training is known by various names or descriptions including, CQB, FIBUA, MOUT, etc. Militec provides a realistic training package that is easy to set-up and program. The User Activated Reactive Target System has been specifically developed to provide the user with an easy method of creating and storing firearms training scenarios for use at close quarter in urban and built up environments. The software utilises a grid system with pull down menus so that settings are easily selected. Up to 50 targets can be programmed using the software and all of the Militec target systems are catered for. The programs can be operated directly from the PC to the range via the C9002RM-USB interface unit. The C9002RM-USB can also be used to download programs to the C9172M and C9200M handsets when training programs are to be operated away from the computer. In either case the hit scores can be retrieved from the range. Below is an example of what a typical training package may contain, the quantities and types of mechanisms will vary according to each particular shooting range and desired scenario. The M2100M Multi-function Mechanism that provides the shoot/no shoot option. The easily fitted brackets offer various target presentation modes. The M3450M Linear Target Mechanism which is designed to provide a realistic target presentation by moving in either an upwards or sideways direction. A selection of trigger devices each with its own short range radio transmitter. The AC310 Sound Distraction Unit. These may be linked to a target mechanism or used as a stand alone unit. A ruggedised portable laptop computer and C9002RM-USB interface. User Activated Reactive Target software. An example of a single stand alone set-up comprising of a target mechanism with a Trigger Receiver and a Sound Distraction Unit is shown below. 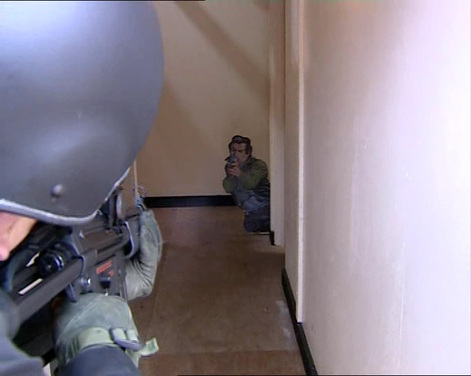 When using the Close Quarter Engagement Training Software a scenario can be created where the target movements are initiated by the actions of the trainees as they advance through the range. Examples of initiators could be opening a door, breaking an infra-red beam, shining a torch into a room or the shooting of a target. The computer or range controller. Trigger devices such as pressure mats, PIR sensors, etc. A radio message sent from another target as it is being triggered, as it turns to a hostile or friendly exposure, as it is hit or as it falls. A target mechanism, as it is being triggered, as it turns to a hostile or friendly exposure as it is hit and as it falls. The setting up and changing of a range layout is easily achievable as communication between the target mechanisms and the trigger devices are via radio thus eliminating the need for trailing cables.